Yes, I Know How To Do Kitchener Stitch. For those of you who discreetly offered help via personal e-mail .... yes, I appreciate kind, helpful and well-intentioned e-mails, but the problem is not that I haven't learned to do Kitchener Stitch. Of course I know how to do Kitchener Stitch. I just hate it. Despise it. But I do know how to do it. I also know how to shimmy on my back underneath the house to wrap insulation around pipes so they don't freeze in the winter. Furthermore, I completely comprehend the processes involved in completing tax forms, emptying an RV septic tank, or performing an enema. However, being capable, even competent, at a task does not mean that I find it enjoyable. And yes, I would rather attempt to devise a Frustrating New Way to join live stitches than do Kitchener Stitch, which will always be more frustrating than any alternative to it. At least in my own personal universe. In the end, neither Kitchener Stitch nor my own joining method made me happy with this otherwise delightful vest, and, considering that this vest involves both lace and alpaca, I opted for three-needle shoulder bindoffs and a reinforcing chain stitch running across the back of the neck. So here it is on the spare bed at our workplace's FEMA housing, getting blocked with stainless steel welding rods. People are slowly getting back into their own houses, getting an apartment, or receiving a FEMA trailer of their very own, so we now have a spare sleeping space at our digs. The spare bed will be a good blocking area as long as the space is available. One of the advantages of photographing your work is that you notice things in scrutinizing the photos, things that slipped past you when you were laying out the garment. For example, in the photo above, I noticed that the center back was not lying straight, so I went back and straightened it afterward. I also noticed that some areas were still wetter than others, so it got rolled up in towels one more time, then laid out agin. Nice thing about the welding rods: they require only a few pins to hold the rods in place. 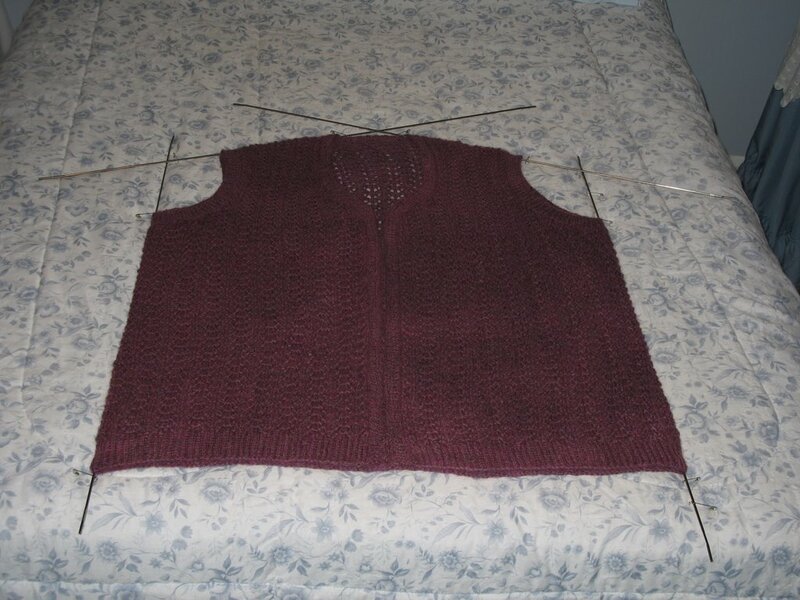 Because this piece did not require severe blocking, I only patted the armscyes into shape. No need to pin. After the piece is dry, the rods will be unpinned and gently removed. Then two towels will be laid over the garment, and it will be very lightly steam ironed through the towels, front and back. This process makes a nice presentation on 100% animal fiber but do not do this with synthetics, as the steam will damage synthetic fibers. And by "lightly iron," I mean that your hand is supporting the full weight of the iron, allowing it to make contact with the towels, but not allowing its weight to rest on the blocked item, or it will flatten the area beneath it. In doing so, you are steaming the garment, not "pressing" it. Now it needs to dry overnight and we'll see the results soon. Seriously I love a free spirit! Am I right in assuming that your camera has either been fixed or replaced...? If either - what kind is it, please? periodically i check in here to see how you're doing. now have an embarrassing confession: bought bunch of blocking rods someone mentioned on KNITU but really did not know how to use them!